HALIFAX – The Atlantic Salmon Federation (ASF) has awarded the Parks Canada team at Cape Breton Highlands National Park with the 2019 T.B. ‘Happy’ Fraser award for Atlantic salmon conservation. 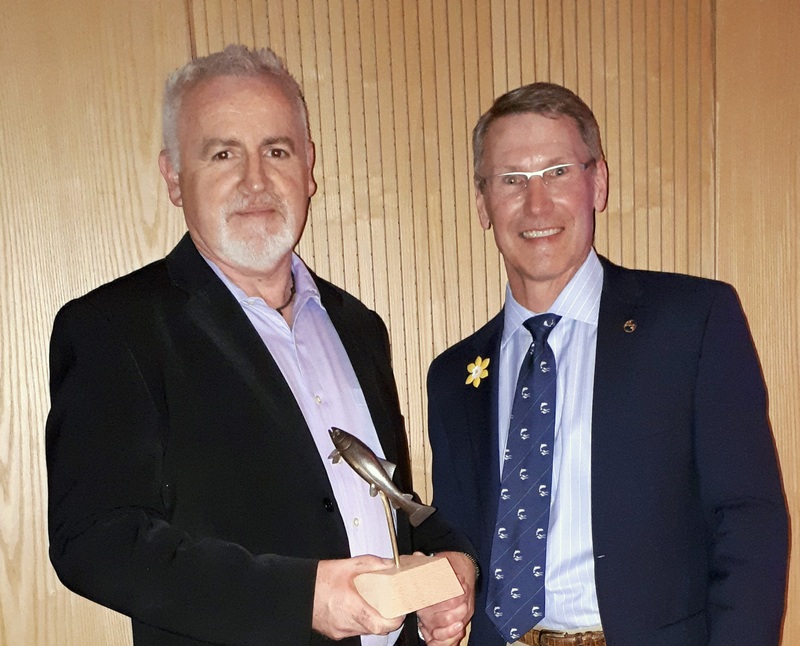 ASF’s top honour for salmon conservation in Canada was given to the national agency for its response to a devastating landslide on the Chéticamp River. 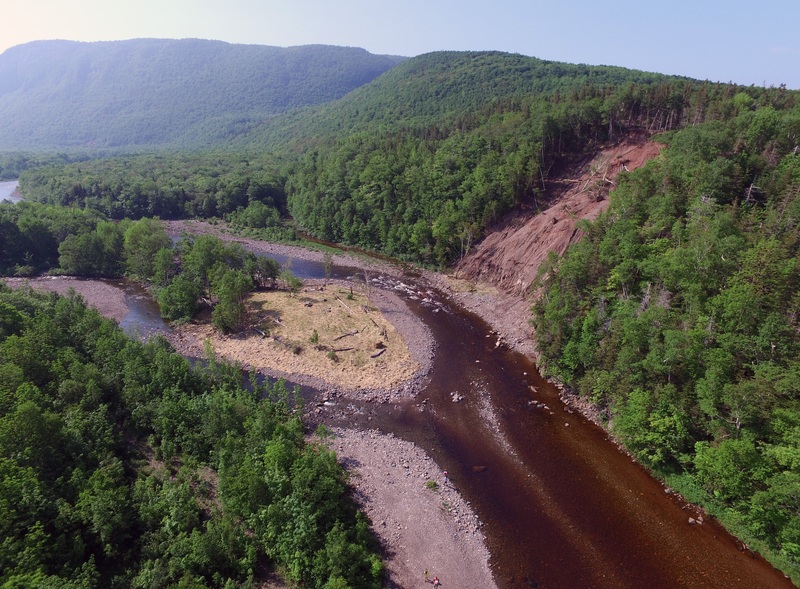 On May 27, 2018, more than 4,000 tonnes of dirt and debris came loose and rushed down a steep embankment inside the park, completely blocking upstream fish passage in the Chéticamp River, home to one of the healthiest Atlantic salmon populations in Nova Scotia. With salmon staging in the estuary, ready to begin their spawning journey into the river, the Parks Canada team had a matter of days to clear the debris and return normal flows. Otherwise, an entire year-class of salmon may have been lost. 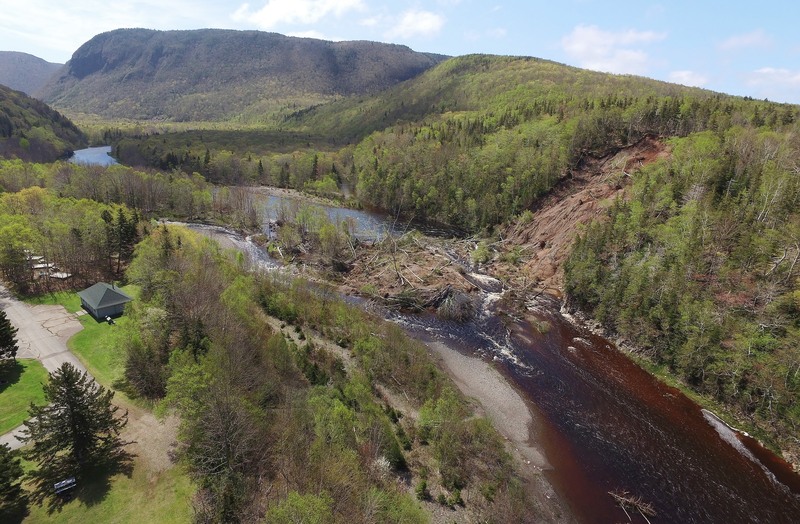 “Within hours, the leaders at Parks Canada contacted the Chéticamp River Salmon Association and began designing a rapid response to the landslide. It did not take long for equipment to be moved on-site and the work to begin,” said ASF President Bill Taylor. Parks Canada assembled a team with expertise in hydrology and stream bank stabilization. They assessed the situation from the ground and the air before digging in to the earthen dam created by the landslide. Archie Doucette, Parks Canada’s Environmental Assessment and Ecosystem Restoration Officer at Cape Breton Highlands, who was involved in the response to the landslide, accepted the award on behalf of the national agency in front of more than 300 people at the annual Halifax fundraising dinner hosted by ASF and the Nova Scotia Salmon Association on April 4th at the Canadian Museum of Immigration at Pier 21 in Halifax. The T.B. ‘Happy’ Fraser award is ASF’s top Canadian honour. It has been given annually since 1975. Fraser was a past president and general manager of the Atlantic Salmon Association, a predecessor of ASF. He became one of the first people to sound the alarm about the Greenland commercial fishery which was taking more than 2,700 tonnes of wild Atlantic salmon in the early 1970s. The Atlantic Salmon Federation was founded in 1948 to conserve, protect, and restore wild Atlantic salmon and their environment.